A large earthquake with a magnitude of 7.4 struck near Acapulco on Mexico’s Pacific coast on Tuesday, sending terrified workers and residents running into the streets and damaging an estimated 800 homes. According to United States Geological Survey (USGS), the quake had a magnitude of 7.4 and put the epicentre at 15 miles (25 km) east of Ometepec, in Guerrero state. Witnesses in the capital, Mexico City, said the tremor sent office workers rushing out onto the streets. An estimated of 800 houses were damaged in Guerrero and Oaxaca states. Guerrero’s governer Angel Aguirre told Milenio television that so far there were no casualties in Guerrero state or nearby Oaxaca state, adding that authorities were checking schools and public buildings near Ometepec. The director of the country’s seismological service, Carlos Valdes Gonzalez, said that there had already been some six aftershocks and further ones could be expected in the next 24 hours. 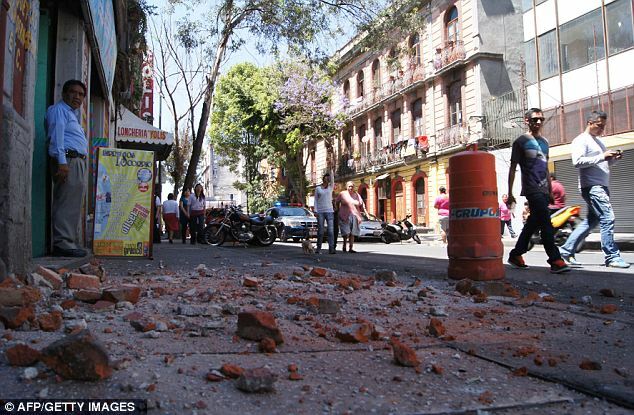 Carlos Valdes Gonzalez said one of the aftershocks had already registered a magnitude of 5.3. A pedestrian bridge reportedly collapsed and crushed a microbus in Mexico City, but there were still no reports of deaths. Office workers and residents were sent running into the streets in wealthy districts and poor neighborhoods alike. Samantha Rodriguez, a 37-year old environmental consultant, was evacuated from the 11th floor of an office block. Sirens could be heard across the city, and police helicopters are crisscrossing the skies. “I swear I never felt one so strong, I thought the building was going to collapse,” said Sebastian Herrera, 42, a businessman from a neighborhood hit hard in Mexico’s devastating 1985 earthquake, which killed thousands. Mexico City Mayor Marcelo Ebrard’s Twitter account said the water system and other “strategic services” were not experiencing problems and no damage was reported in the central or northern areas of the city. Mobile phone networks have been affected, our correspondent says, and people have had trouble contacting their loved ones. Gabino Cue, the governor of Oaxaca state, next to Guerrero state, said via Twitter that the quake had caused cracks in school buildings and damaged roofs in one part of the state. The USGS said the epicentre was 11 miles (18 km) underground. The US president’s daughter, 13-year-old Malia Obama, was on a school trip in Oaxaca, south-western Mexico. A White House official said she was safe and had never been in danger.